YOU might think beef dripping and suet have had their day, given the unstoppable rise of olive oil and the powerful health lobby. But Bolton food manufacturer AMKO is churning out 150 tonnes of beef dripping every year — and has seen sales soar after it was featured on TV food programmes. Now, along with beef and vegetable suet and a range of barbecue spices, the company delivers its products to 1,500 independent butchers and farm shops all over the country. Owner Peter Martindale said the rise of beef dripping sales, once a staple in everyone’s larder until cooking oil became fashionable, is down to certain TV chefs advocating a return to “real” food. His company in Bolton processes goose fat and duck fat — again promoted by TV chefs including Nigella Lawson. But they claim that AMKO is the only British company to have full EU accreditation for its beef and vegetable suet. Mr Martindale said: “It took us nine months to get it with help from Bolton Environmental Health department and we had to show proper health and hygiene standards. “We have sent staff on courses and we had to show we had all the correct processes documented. Mr Martindale used to work in a slaughter house until he was made redundant 20 years ago, which prompted him to set up AMKO, initially selling his own mix of barbecue spices to butchers he had met at the slaughterhouse. Now, the company is thriving and has its own small delivery depot in Doncaster serving the east coast, while west coast deliveries are handled from Bolton. AMKO makes and sells a wide range of suets and has a range of about 40 barbecue spices, beef dripping, dumpling and doughball mixes, Yorkshire pudding mixes and pancake and stuffing mixes, and they also deliver a range of other products, including jams. 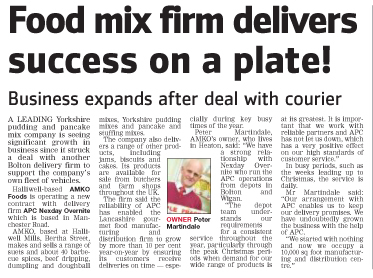 Mr Martindale, who lives in Heaton, said: “We certainly notice the peaks and troughs of products like goose fat and dripping as they go up when the TV chefs use them and we are lucky we can accommodate that with our workforce. New AMKO blends include gluten free nonhydrogenated vegetable and beef suets, which are already proving popular with their customers. Mr Martindale said: “I think we have worked hard over the years building the business into a company that produces a wide range of high-quality products.